My Friend Michael Wayne just wrote an excellent article for the Albany Times Union that quite profoundly — and succinctly — exposes what for many is a sad reality. A couple of key points he makes that ought to be an massive eye opening moment for us. 1. Death related to prescription drug use is the 4th largest cause of death in this country. 2. The drug use by Americans and this is doctor prescribed pharmaceuticals NOT illegal drug use, AVERAGES 12 prescriptions per person! 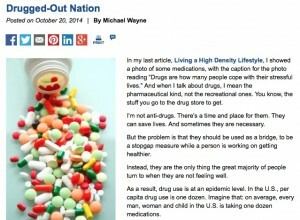 Since I don’t take any and Michael Wayne doesn’t take any drugs at all, that means some folks are taking a lot more than 12! In my own family, my dad (who is 87 and pain free, drug free, healthy as a horse) watched several of his beloved brothers die as a result of their doctor prescribed medications. Of course I could turn this article into a blatant plug for hypnosis and the power of your own mind to not only focus on health instead of sickness but to activate your own natural on board pharmacopeia of feel good hormones and immune boosting thoughts. I could suggest to you that your neurology has almost infinite capacity to heal, and change, but I think I am going to simply suggest you read Michael’s article and then if you have questions, email him or me. Here’s the link to Michael’s article. The bottom line? Take charge of your own health and your own change by becoming pro-active, well read and responsible for your own happiness.